January 2017: The Suffering Eyes Project is a founding member of the Kingston-based Evolve Our Prison Farms initiative to restore Canada's prison farms as innovative plant-based agriculture enhanced by farmed animal sanctuary, rather than returning the former prison dairy operations. October 22, 2016: Franceen Neufeld spoke at Kingston VegFest 2016 "Lies I Told Myself"
September 25, 2016: Calvin Neufeld spoke at Vegfest Guelph 2016 on "The Hope(lessness) of a Vegan Future"
August 16, 2016: Franceen Neufeld and Calvin Neufeld presented their Kingston Prison Farm Sanctuary Proposal at Kingston City Hall meeting hosted by MP Mark Gerretsen and Minister of Public Safety Ralph Goodale. 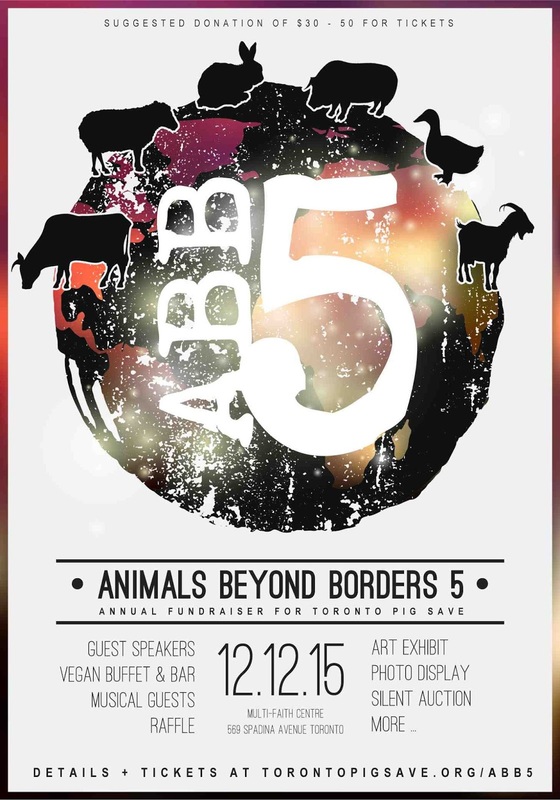 December 12, 2015: Calvin Neufeld spoke and read from Suffering Eyes at Animals Beyond Borders 5 in support of Toronto Pig Save. Recently, TPS co-founder Anita Krajnc was charged with criminal mischief for giving water to thirsty pigs in a slaughterhouse-bound truck. Her defense: We must give water to the thirsty. Honouring this, the theme of Calvin's talk was simplicity. November 30, 2015: Novelist Robin Lamont reviews Suffering Eyes for Our Hen House. August 2, 2015: Calvin Neufeld, editor of Suffering Eyes: A Chronicle of Awakening, spoke on "The power(lessness) of words and art in animal advocacy" at the Animal Rights National Conference in Washington D.C. Author Franceen Neufeld was in attendance. The conference featured 150 speakers from around the world, attracting an unprecedented 1,600 attendees. September 27, 2014: The Suffering Eyes Project had a booth at the Montreal Vegan Festival / Festival végane de Montréal. September 21, 2014: The Suffering Eyes Project had a booth at Guelph's first VegFest. Calvin Neufeld gave a reading of Sanctuary, and Franceen Neufeld gave a talk on connectedness: "If You've Come, You Belong: connectedness as a way of life". June 2014: Suffering Eyes has been added to the curriculum of the Animal Ministry Institute, in their Ethics section. Read the Director's book review of Suffering Eyes. In her new book Suffering Eyes: A Chronicle of Awakening, author Franceen Neufeld describes her late awakening to the suffering of animals at the hands of humans. Finding her way through grief and despair to a transformative encounter with the goodness of life, her book ends with an affirmation of hope. As her son writes in his Afterword, “in awakening there is hope.” But can there also be joy? Is there room in the awakened life for happiness? Franceen’s exploration of these questions will be interwoven with readings from her book. "Sanctuary: A children’s story for all ages"
Calvin Neufeld will be unveiling his little book, Sanctuary: A children’s story for all ages, which was created in support of the Suffering Eyes Project to raise funds for farmed animal sanctuaries. This lighthearted (but serious) illustrated book looks at our past and potential present relationship with animals through childlike eyes, seeing the obvious with simplicity. May 18, 2014: Kick-Off Party for Toronto's March To Close All Slaughterhouses. "This fun, yet meaningful evening will feature special guests, Franceen Neufeld (author of Suffering Eyes: A Chronicle of Awakening) and her editor, publisher and son, Calvin Neufeld, who will present the book, as well as the Suffering Eyes Project." March 31, 2014: First major distribution of Suffering Eyes books to North American sanctuaries. March 2014: Read The Peaceable Table's book review of Suffering Eyes. February 11, 2014: Interview on Animal Voices radio, "Portraits of Grief" (30 minutes). 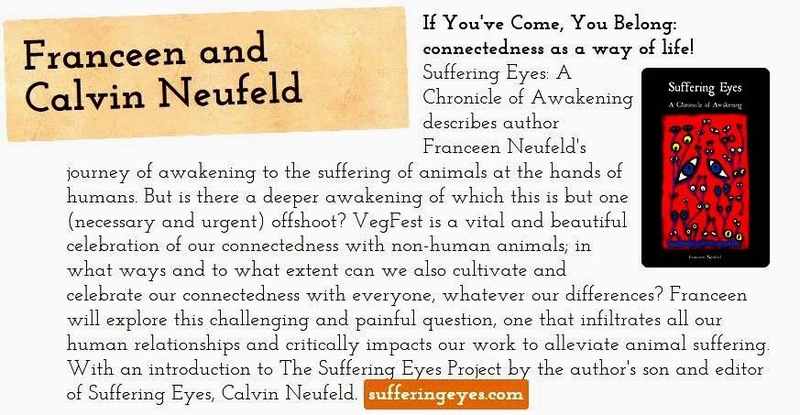 "Animal Voices welcomes Franceen and Calvin Neufeld, author and editor, respectively, of Suffering Eyes: A Chronicle of Awakening. Presented in journal form, the book explores Franceen’s grief, rage, and guilt as she grapples with issues of animal suffering. We will also touch on coping with the dynamics within families that are at different points in understanding animal issues, and connections to Calvin’s work on bullying." January 23, 2014: Article by Desmond Devoy, Perth Courier, "Author of Suffering Eyes, feels animals' pain, puts words into action"